The time I tried to teach kids. flat black 5 foot tall and 7 foot wide cube is in front of and -10 feet above a 15 foot tall and 20 foot wide beige wall. a .2 foot tall and 7 foot wide and .5 foot deep [metal] cube is -5.2 feet over black cube. a 7 foot tall woman is 1 foot in front of the wall. she faces black cube. a flat white 1 foot tall "Vocabulary" is in front of and -1.5 feet over the black cube. a 1st 3.5 foot tall and 6 foot wide wood table is 2 feet in front of and 2.5 feet right of the woman. it is facing back. a 5 foot tall chair is -1 foot behind the table. a 15 foot tall and 20 foot wide teal wall is in front of and -1 inch to the right of the beige wall. it is facing right. a 2nd 3 foot tall and 3 foot wide and 3 foot deep wood table is 5 feet in front of and -3 foot to the left of the table. a 3rd 3 foot tall and 3 foot wide and 3 foot deep wood table is 2 feet to the left of the 2nd table. a 4th 3 foot tall and 3 foot wide and 3 foot deep wood table is 2 foot to the left of the 3rd table. a 1st 3 foot tall boy is -2 feet in front of and -2.2 feet to the right of the 1st table. he is facing left. the boy's shirt is [pattern]. a 1st 4 foot tall white chair is in front of the 2nd table. it is facing left. a 2nd 4 foot tall white chair is in front of and -1 foot to the right of the 3rd table. it is facing right. a 2nd 3 foot tall boy is -2 foot above and -1 foot to the left of the 1st chair. the 2nd boy's shirt is [pattern]. he is facing front. a 3rd 3 foot tall boy is on the 3rd table. he faces back. the 3rd boy's nice shirt is pink. a brown head of hair is -1 foot above the 3rd boy. the head of hair faces back. the ground is tile. the sun is peach. it is noon. a lavender light is 5 feet in front of the 2nd boy. 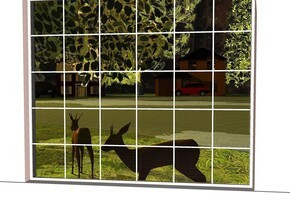 a 1st [animal] painting is 1 foot to the right of and -2 foot above the cube. a 2nd [animal] painting is -5 feet above the 1st painting. a large [alphabet] painting is 1 foot to the left of the cube. Oh crap, turn left! turn left! a 1st tree. a 2nd 40 foot wide and 25 foot tall tree is 45 feet to the left of the 1st tree. a large horse is 10 feet in front of and -18 feet to the left of the 2nd tree. it is facing back. a 12 foot tall and 6 foot wide woman is -9 feet above the horse. she is facing back. the ground is [woods]. the ground is 300 feet wide and 1 foot tall. the 2nd tree's tree trunk is chestnut tree brown. a 3 foot tall laptop is on a 1st 6 foot wide and 5 foot tall table. a 1st 20 foot tall and 70 foot wide sea mist blue wall is to the left of the table. it is facing right. a 2nd 6 foot wide and 5 foot tall table is 5 feet behind the 1st table. a 1st 7 foot tall chair is in front of the table. it is facing back. a 15 foot tall woman is -4.5 feet above the ground. she is -4 feet in front of the chair. she is facing back. a 20 foot tall wood door is -.1 foot behind and to the right of the wall. a 2nd 30 foot tall and 40 foot wide teal wall is to the right of the door. it is noon. the ground is 10 foot wide tile. a 3rd 10 foot wide and 5 foot tall table is 6 feet to the right of the door. it is in front of the 2nd wall. a 4th 5 foot tall and 10 foot wide and 10 foot deep table is 15 feet in front of the 3rd table. a 2nd 7 foot tall chair is -1 foot to the left of the 3rd table. it is facing right. a 1st very large book is 0 inches above and -5 foot to the left of the 3rd table. it is facing the chair. it is leaning 90 degrees to the back. a 14 foot tall person is in front of the 2nd chair. he is facing the table. a 2 foot tall mug is -3 foot to the right of and above the 3rd table. a .8 foot tall cup is to the right of the laptop. a 11 foot tall and 11 foot wide [citymice] painting is in front of and -22 feet above and -20 feet to the left of the 2nd wall. the laptop's screen is .48 foot tall [scene]. the sun is brown. a dim linen light is 10 feet above and to the right of the woman. a sweet pink light is in front of and -5 feet above the person. a 3rd 7 foot tall chair is -1 foot to the left of the 4th table. it is facing the table. 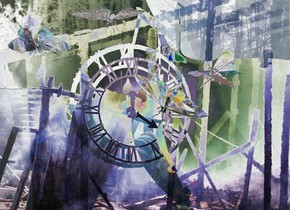 an 9 foot tall and 10 foot wide [lemursdream] painting is to the right of and -11 feet above and -30 feet behind the 1st wall. it is facing right. a 1st 20 foot wide and 20 foot deep tile floor. a 20 foot wide and 12 foot tall forget me not blue wall is behind the floor. a bed is in front of the wall. a 2nd 2 foot wide and 12 foot tall forget me not blue wall is in front of and -2 feet to the right of the floor. a 10 foot tall door is -1 inches to the left of the 2nd wall. it is facing southwest. it is -3.2 foot in front of the floor. a 3rd 15 foot wide and 20 foot tall forget me not blue wall is 0 inches to the left of the door. a 4th 2 foot tall and 4 foot wide forget me not blue wall is 10 feet above the floor. it is -1 inches to the left of the 2nd wall. a 7 foot tall woman is behind and -2.3 foot to the right of the 3rd wall. she is facing the bed. the camera light is black. a border collie is -4 feet above and -3 feet to the left of the bed. a 5th 20 foot wide and 12 foot tall forget me not blue wall is to the right of the floor. it is facing right. a 6th huge [wall] wall is 5 feet in front of the door. a 7th 20 foot tall and 20 foot wide [window] wall is to the left of the floor. it is facing right. the sun is linen. a baby blue light is behind and -1 foot above the woman. a yellow light is 2 feet in front of and above the woman. a lavender light is to the left of and -.5 foot in front of and -1 foot above the dog. it is noon. a tennis ball is -2.5 foot above and -2 foot in front of and -2.5 foot to the left of the bed. a large dresser is 0 inches to the left of the 5th wall. it is facing left. a 5 foot tall and 6 foot wide and 5 foot deep shiny white table. a 1st 8 foot tall and 6 foot wide and 3 foot deep bench is in front of the table. it is facing the table. a 2nd 8 foot tall and 6 foot wide and 3 foot deep bench is behind the table. a 1st 5.2 foot tall and 40 foot wide cream wall is to the left of the table. it is facing left. a 8 foot wide and 8 foot tall window is 0 inches above the wall. it is facing left. a 2nd 8 foot tall cream wall is -1 inch in front of the window. it is facing right. a 3rd 8 foot tall cream wall is -1 inch behind the window. it is facing right. a 10 foot tall woman is -9.5 feet above the 1st bench. she is facing the table. a 2nd 10 foot tall woman is -9.5 feet above the 2nd bench. she is facing the table. a 1st 1 foot tall glass is -1 foot in front of and 0 inches above the table. a 2nd 1 foot tall glass is -1 foot behind and 0 inches above the table. a 1st 8 foot tall car is 3 foot to the left of the 1st wall. it is facing the wall. a 2nd 7 foot tall car is 4 feet behind the first car. it is facing right. a building is 20 feet to the left of the 1st wall. it is facing right. a 80% dim dodger blue light is 10 feet above the 1st car. a 50% dim cream light is 5 feet above the table. When the neighbors cut through your yard. a 2 foot tall and 20 foot wide shiny white wall. a 5 foot tall and 6 foot wide window is -.1 inch above the wall. a 1st 5 foot tall shiny white wall is -.1 inch to the left of the window. a 2nd 5 foot tall shiny white wall is -.1 inch to the right of the window. a 20 foot wide wood floor is in front of the 2 foot tall wall. the ground is grass. a pavement lake is 15 feet behind the 2 foot tall wall. a large house is 15 feet behind the lake. a 1st very large tree is -35 feet to the left of the house. a 2nd very large tree is -60 feet to the left of the 1st tree. a 3rd tree is 5 feet behind and -5 feet to the left of the window. a 4th large tree is -25 feet to the left of the lake. a 2nd house is -50 feet to the left of and in front of the 2nd tree. it is facing the window. a 1st deer is 3 feet behind the 2 foot tall wall. it is facing left. a 2nd deer is 2 feet behind and 1 foot to the left of the 1st deer. it is facing the 4th tree. a 1st large car -5 feet behind the lake. it is facing left. a second large car is in front of and -20 feet to the left of the 2nd house. it is facing northwest. a 5th very large tree is -10 feet to the right of the large house. the sky is [forest]. it is 500 feet tall. 2 lemon lights are 5 feet in front of and -20 feet above the very large house. a gold light is above and in front of the very large house. a peach light is 10 feet in front of the window. Doesn't smell like food but I'd better eat it just in case. a 50% linen sink. a soap bar is -5.5 inches above and -2 inches in front of and -2 inches to the right of the sink. a tile wall is behind the sink. a 2 foot wide mirror is in front of the wall. it is 2 inches above the sink. a large shower is 6 feet in front of the sink. it is facing the sink. a 15 foot tall and 5 foot wide [fishes] curtain is behind and -15 feet above and -3 feet to the right of the shower. 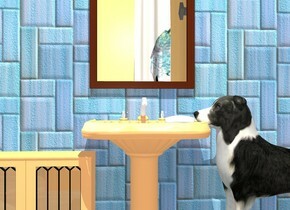 a 2.6 foot tall border collie is to the right of the sink. it is facing the sink. it is leaning 10 degrees to the back. a 2 foot tall 50% linen cabinet is 6 inches to the left of the sink. the camera light is dim linen. the ambient light is dim linen. a cream light is 3 feet in front of and above the mirror. a 5 foot tall woman is -2 feet over a green sofa. she is facing left. she is leaning 80 degrees to the back. a large book is -4 feet to the left of the woman. the book is -1 foot above the woman. the book is facing right. it is leaning 45 degrees to the front. a 12 foot high and 6 foot wide window is 1 foot behind the sofa. a 1st 12 foot high tile wall is 1 foot behind the sofa. it is -0.1 inches to the left of the window. a 2nd 12 foot high tile wall is 1 foot behind the sofa. it is -0.1 inches to the right of the window. the sun's azimuth is 180 degrees. the sofa is on a large wood floor. a 5 foot tall lamp is to the right of the sofa. a rug is in front of the sofa. a 2.5 foot high dog is on the rug. the dog is facing right. a tennis ball is to the right of the dog. a 2.5 foot high boy is 1 foot to the right of the tennis ball. the boy is facing the dog. a 1st black computer is -0.8 foot to the left of the boy. the computer is 0.8 foot over the ground. the computer is facing right. a bookcase is 2 inches to the left of the sofa. a chair is in front of the bookcase. it is facing southeast. a 4 foot high professor is on the chair. a 2nd computer is in front of the professor. the computer is -.5 feet to the right of the professor. it is 2.5 feet above the floor. it is facing the northwest. the ambient light is ivory. the camera light is brown. a brown light is 1 inch over and 1 inch to the right of the professor. an indigo light is 1 inch over and 1 inch to the left of the boy. a dim orange light is 1 foot over the woman. a 12 foot high tree is 2 feet behind the window. a yellow light is -2 foot above the lamp. a tan sofa. a 10 foot high 20 foot long pale lemon wall is behind the sofa. the sofa is .1 inch over a 20 foot wide floor. the floor is in front of the wall. a laptop is on the sofa. it is -2 foot to the right of the sofa. a small dog is .5 foot to the left of the laptop. the dog is facing the laptop. a small table is 1 foot in front of the sofa. a 1st book is on the table. the book is leaning 90 degrees to the back. a 2nd book is -1 inch over the 1st book. it is -8 inch in front of the 1st book. it is -3 inches to the right of the 1st book. it is leaning 90 degrees to the front. a 3rd book is on the floor. the book is small. it is in front of the sofa. it is 3 inches to the right of the table. it is facing the back. it is leaning 20 degrees to the front. a glass is 1 inch to the left of the 1st book. a headwear is on the second book. the headwear is facing back. a 1st tennis ball is on the sofa. it is -2 inches to the right of the dog. 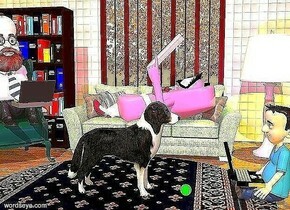 a 2nd tennis ball is next to the sofa on the right. a small toy is 6 inches in front of the 2nd tennis ball. the toy is facing left. the camera light is tan. there are 5 glass dogs. 5 feet in front of them there is a cube. the cube is 2 feet over the ground. 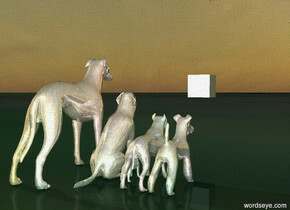 dogs are looking at the cube. the ground is a grassland. it is dawn.